Hi Everyone! Jana here! 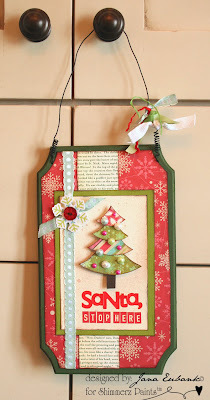 I created this fun doorhanger using a wood plaque sign from the Dollar Tree. I love creating door hangers! They are the perfect decoration to spread a little Christmas cheer in an unexpected place. 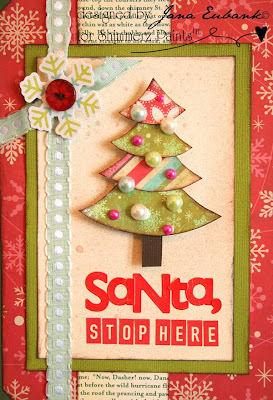 :) And what Christmas project wouldn't be complete without a little shimmer and shine?!! 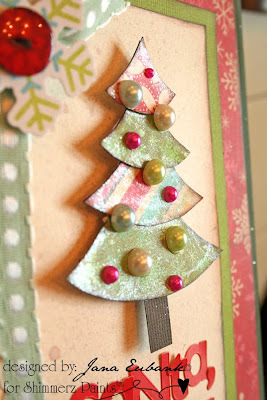 The paper pieced Chrismtas Tree is painted with Pixie Dust Blingz. The cream cardstock background is spritzed with Treasured Hymn, Mudpie and Licorice Spritz. Love it---love it---love it!!! Need I say more?